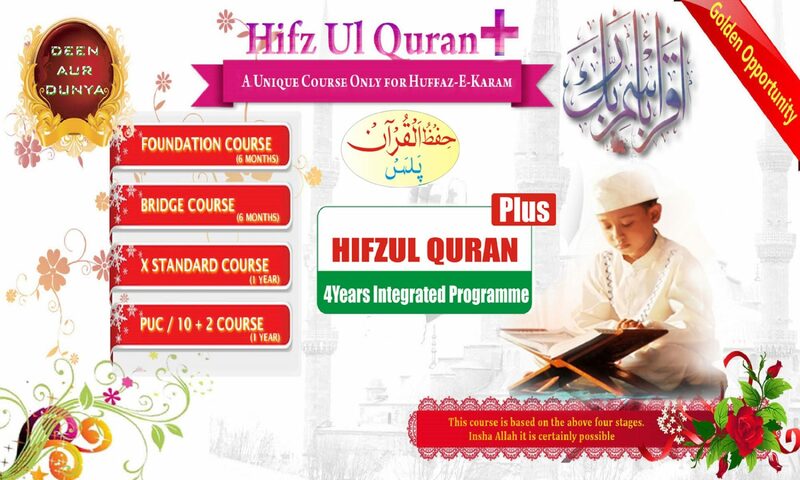 Hifzul Quran Plus is for huffaz between 12 to 17 years. A 4-year integrated course for Huffaz-E-Karam for getting modern education. By pursuing this course and by appearing in competitive exams (NEET-IIT JEE), Huffaz will be able to get admission into MBBS, BE, & MBA. In’Shaa’Allah, this is possible. This course consists of four phases. Foundation Course: (6 months) apart from reading and writing in English and Hindi, basic education of mathematic. Bridge Course: (6 months) Huffaz are trained to be eligible for 10th class’s basic Science, Math, English, and Grammar of Languages. 10th class: (1 year) a complete preparation for appearing 10th class with maximum marks. Junior College: (2 years) preparation of 12th class along with competitive examinations. Alhamdulillah! This course is successfully being run for the past 5 years in Shaheen, Bidar, KA. Huffaz that were not in touch with modern education, in a very short period of 3 to 4 years have completed 10th, 11th, 12th and have taken admission for MBBS, BE, BSc, etc. Islamic Scholars, Educational Experts, & Intellectuals throughout India are appreciating and supporting this program and it is their wish that this program be introduced throughout the world. Alhamdulillah, this program has been started in various cities throughout India with the help of such concerned persons. Admissions are open, interested Huffaz can take admission in the nearest centers.